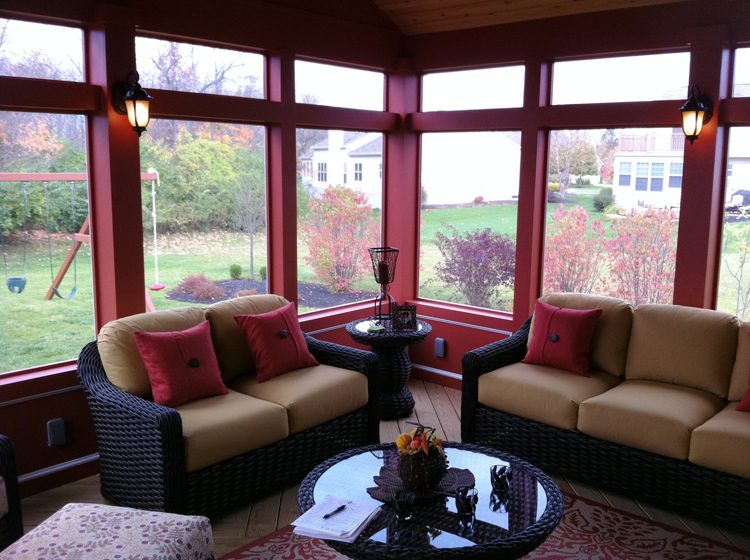 Screening considerations for Columbus, OH porches – it’s not just about the window screens! Archadeck of Columbus discusses screening considerations for porches. Autumn is a time when many homeowners begin to think more about having a protected outdoor space to enjoy the beauty of the season and the milder temperatures. One of the most popular outdoor spaces to utilize the fresh fall air and still have protection from inclement weather is a screened porch. Screened porches have always been a beloved addition to the home and backyard. But there are many things to consider when thinking of building a screen porch. One of the most important of these considerations is the screen itself. The screen of the screened porch is the lifeblood of the structure, it is the element that enables you to remain protected from insects, rain, and the dangers of the sun. Nowadays, screening options have evolved from the old-fashioned screened porch of yesteryear. There are more choices with higher quality benefits that not only aid in getting the most enjoyment out of your porch, but they also promote longevity of your space. The old-fashioned way of screening which you can purchase at your local hardware store, involves aluminum screen that is approximately 4 foot wide. This screen is stapled to the posts all around the perimeter of the openings on the porch; once the entire screen is stapled a piece of trim is then placed on top. Archadeck of Columbus doesn’t like, or use, this type of screen since aluminum creases easily and using it can lead to a wavy looking screen if it is not installed properly. More importantly, this type of screen can be affected by birds, branches, falling object and other screen hazards because of its flimsy nature. We offer our customers more options when it comes to screening their porch. One of these options is using aluminum framed screen inserts. These inserts consist of aluminum with fiberglass screen which we have made locally so we are able to ensure they are made to custom sizes which ensures a custom fit. Once we finish the shell of the screen porch, we get exact measurements for the screens and then custom order them. We also use a product called Tiger Screen which is made from really strong fiberglass screening. With Tiger Screen we custom build the screen on site. 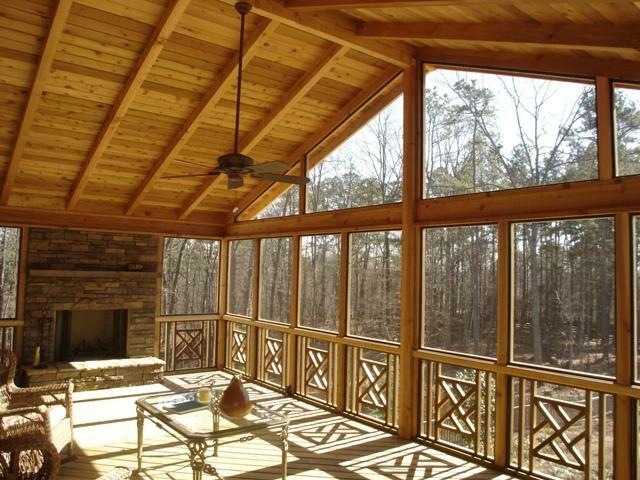 When the perimeters of your screened porch openings require a span of larger areas, we also use Screen-Eze. This product allows us to screen in much larger areas such as 6-10 feet. Screen-Eze comes in wider spans, and is very strong which minimizes the need for additional posts. You get a cleaner, less interrupted view with this product. It is important to have a professional builder with background and knowledge of screening options to help you make the right decision for your porch needs. Archadeck of Columbus factors in many details to make sure you get not only the look you want, but also a solid screen installation. Just for example, many homeowners have pets and these customer would benefit from using a knee-wall across the bottom of the screened porch to prevent animals from walking into or damaging the screen with their claws. Pet owners can also benefit from using Screen-Eze because with this product you can throw a baseball into the screen and it will revert back to its original shape within minutes. If your porch is low to the ground, you may consider screening from floor to ceiling. 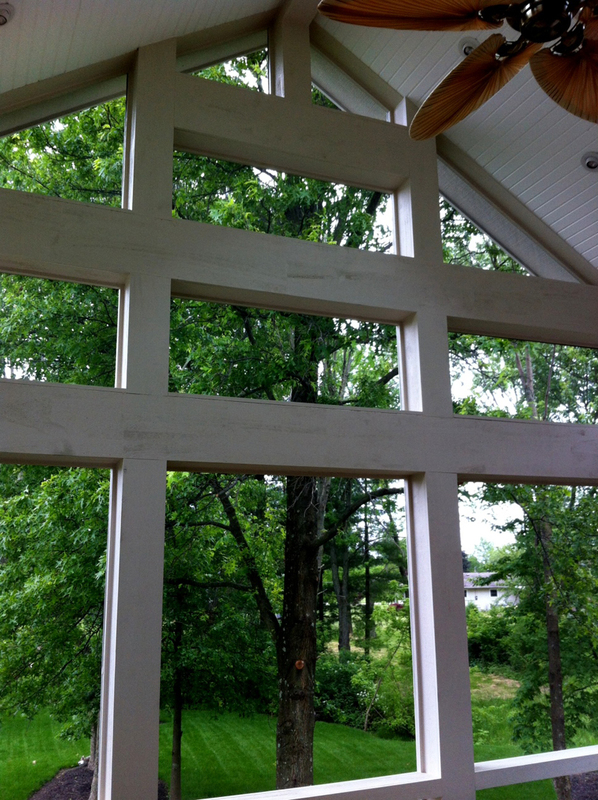 This method of screen installation opens up the porch to deliver panoramic views and plenty of fresh air. If your porch is located in an area that receives a great deal of sun, we can install charcoal tinted screen that helps deflect the UV rays of the sun. These screens also help provide additional shade when the sun is setting low in the sky. Last but certainly not least, always make sure there is screening under your porch to keep the bugs out. It is better to do this while the porch is under construction rather than an afterthought when the first mosquito finds its way into your safe haven! Archadeck of Columbus always installs screen on top of the framing and underneath the decking. We do not install it underneath the framing because debris will accumulate between the deck and floor boards. In order to keep your deck tidy and clean, our way ensures you can blow all the dirt out. If you place the screen under the joists, it makes blowing dirt away nearly impossible. Notice the kneewall present in this screened porch. 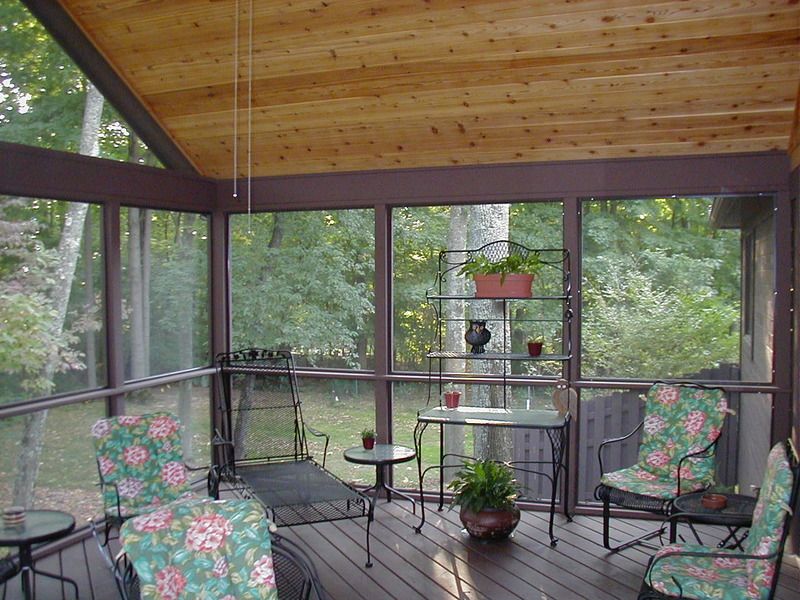 If you already have an existing screened porch that has screen installed the old-fashioned way, Archadeck of Columbus can retro-fit your porch with one of our more advantageous screening options. If you are ready to begin a screened porch from scratch we would love to meet with you to discuss your needs and choose a screen porch design that best suits your lifestyle and budget. You can see more examples of our versatile screening styles and techniques by visiting our screened porch photo gallery and our 3 and 4 season room photo gallery located on our website.